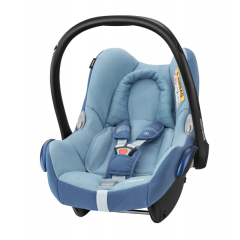 The Maxi-Cosi CabrioFix baby car seat is a safe and smart choice for your baby’s first car journeys. It simply adjusts to fit as your newborn grows, for use up to the age of 12 months (13kg). In it, your baby travels in the recommended rear-facing position. 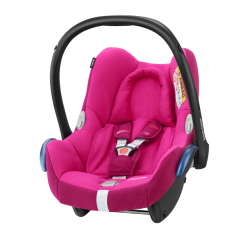 It’s been tested to exceed strict European baby car seat safety standards and has enhanced side impact protection. But it’s still light to carry and has an ergonomic handle to make moving to and from the car easier. 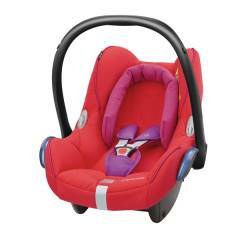 It’s available in a choice of stylish colours at great prices at our Maxi-Cosi Outlet. 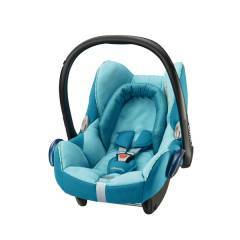 Baby and parents can relax on longer journeys thanks to the CabrioFix’s comfortable soft padded seat. The cushioned harness has a one-pull adjustment system for a quick, secure but easy fit. And it comes complete with a head hugger for gently cradling your newborn’s head. The CabrioFix can also be used with all Quinny and Maxi-Cosi pushchairs to create a versatile travel system. Using our secure adaptors, it fixes simply to your pushchair for a fuss-free move from road to pavement. And there’s a choice of stylish accessories available to complete the look. The CabrioFix baby seat aims to make journeys as easy as possible. Harness hooks keep the straps out of the way so you can settle your baby easily. There’s also a handy built in sun canopy, so you can always shield your baby’s face from strong rays. And you can easily remove and wash the cover to keep it clean and hygienic. 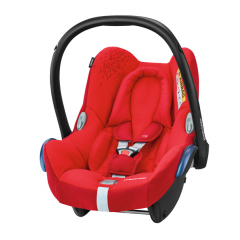 It’s suitable for use with your car’s IsoFix system with the addition of a base like Maxi-Cosi FamilyFix (available separately). Or for versatile, secure use in almost any car, fit it using your car’s three-point seatbelt.